Technology has brought a sea change for book readers. Most of the books are now available from print to digital or electronic formats and well matched with diverse e-book reading apparatus like Kindle, iPad, Sony Readers, Ms readers etc. Data Entry Help can provide outstanding ebook conversion, creation and optimization service at most economical charges to convert voluminous content from PDF, Word, normal paper back, HTML or any other format to a superior quality e-book. Data Entry Help utilize Optical Character Recognition (OCR) technology to convert & optimize the scanned document into editable text and receive 100% correct file from these printed scanned material. Data Entry Help can undertake all kinds of printed books, paper-based data, web based articles and manuscripts as well as paper based articles for conversion. The final output is provided in fully electronic format such as e-book, ezines, e-brochures, e-research papers and e-journals that can be uploaded on the web after converting them into HTML pages. We have highly skilled manpower who can convert all kinds of books, catalogues and journals which may consist of images, tables, graphs, etc. 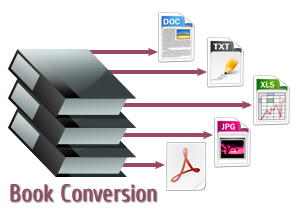 We provide quality e-book conversion that people can easily refer to. We can help publish online a wide range of formats like HTML, PDF and other file formats. We can create online brochures and magazines. We follow a professional approach and step-by-step procedure to produce any volume of given work to our client in very reasonable rate in given TAT.